90mph, pedal to the metal, turning right into the sun. Weeee! It took all week, but the car finally came together Friday afternoon, just in time to get down to Savannah, GA for a weekend with NASA. In the last week, the car has been upgraded with a coil-over spring kit, slightly lowered, fresh brakes installed, a new air intake swapped in, and my full suite of safety gear is installed inside the car. Roebling Road is a deceptively simple, 9 turn track that's just over 2 miles long. 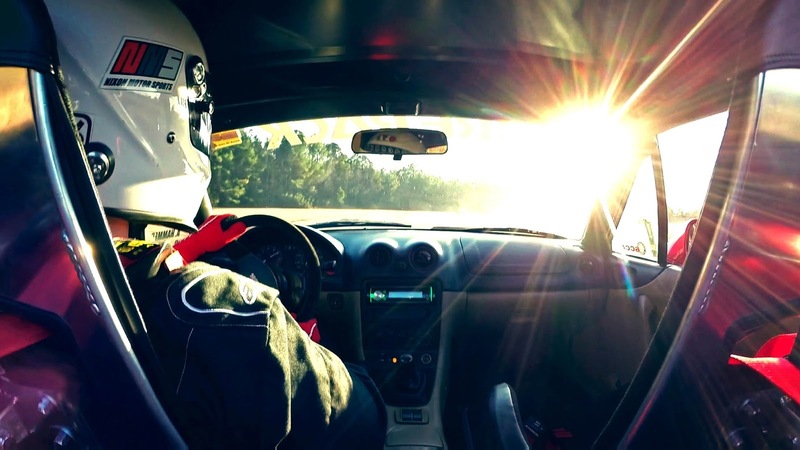 I was there back at the end of 2016 with SCCA and remember being frustrated with how difficult it was to carry lots of speed through the almost constantly sweeping turns. 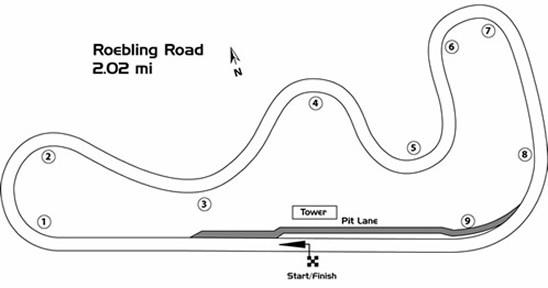 Thanks to some generous gift certificates for Christmas, I knew I wanted to take another shot at pushing the Miata around this challenging circuit before the next Lemons race. Kyle, Ian, and I set up camp near start/finish and took turns running in different High Performance Driver Education (HPDE) events. I started the weekend at level 2, which allows me to drive on track without an instructor but limits me to passing only on designated straights. Ian is in level 3, which adds the option to pass anywhere on track as long as you point the passing car to the side you want them to pass. Kyle bumped up to a certified instructor this weekend and was having fun in the top level 4, which allows open passing anywhere on track and point-bys are not required. Had some down time waiting in grid. At the end of the weekend I got signed off to bump up to level 3, so I'll enjoy more flexibility to get around slower cars when we all head to Road Atlanta in March. NASA's HPDE structure is a great system and really helps get drivers comfortable with driving on track and provides a great ladder toward more competitive track driving or racing. New seats and harnesses installed. Although not fully required, I wanted to bump up my level of safety on track as I start to push harder. The car now meets most of the key safety requirements for all major road racing sanctioning bodies. Not the best GPS on the phone, but the Track Addict app has me down for a hot lap of 1:30.4, averaging 92mph over the 2 mile track. Although I know the car will go faster, I was finally able to start convincing my right foot to keep pushing down the gas pedal even when it feels like the car will fly off the track at any moment and push through some of the fear. The toughest part of Roebling for me was the very tricky Turn 9, the last turn before the front straight. Carrying over 90mph through a corner and welding the gas pedal to the floor is a pretty amazing experience.